Her chest burned, her side felt as though it had been speared by a hot dagger. Fiona paused to drag in a shuddering breath, then forced herself to run again. Her leather-shod feet pounded the bracken and undergrowth as she tore across the barren landscape toward her home. Already, smoke spiralled up from among the Scotch firs that encircled Pennglas, the fertile little settlement on the east coast of Aberdeenshire, Scotland, which she called home. The mud and thatch dwellings would ignite easily, fired by the Viking raiders who even now would be plundering the defenceless cottages. They would seize what they wanted then the vicious barbarians would swarm back across the beach with as much plunder as they might carry, back to their infernal dragon ships in readiness to raid further down the coast. Their attacks were frequent and deadly, but mercifully swift. The damage the marauders left behind was likely to be of a more permanent nature. The homes and barns of Pennglas would burn fiercely unless someone was on hand to direct the firefighting. Would her father’s serfs know to form a chain, to pass water up from the burn to drench the flames whilst her father and brother mounted a fruitless pursuit of the invaders? Fiona doubted it. Rather, the villagers would stand and watch as their homes were consumed by the fires. By the time her father returned, empty handed as he always did, their homes would be ashes. Why had she chosen this day of all days to visit Aikrig, the neighbouring village? She had wished to consult with Taranc, her friend and—just possibly—her betrothed, but the matter was not urgent and he was not even there when she arrived. Her errand could have waited. She should have been at home, at Pennglas. She should have been on hand to rally their people, to chivvy them into hiding in order to save their lives and then to command the subsequent scramble to save their homes. As she neared the forest clearing, the sounds of battle reached her. Swords clanged, shouts rang out. A child screamed, a horse whinnied in startled fright. The raiders had not yet left, and already their village was aflame. The bastards. They were savage enough to do that, truly brutal in their greed and their cruelty. The clamour of fighting grew louder as she approached. Fiona slowed her steps now, caution and fear for her people causing her to hesitate. How best to combat this new manner of threat? How best to respond when their peaceful settlement lacked the might and weaponry, not to mention the bloodlust needed to face up to these warlords from across the sea? Fiona halted on the outskirts of the village and peered between the trees. She recoiled at the sight that met her. Many of the villagers, mostly the younger, stronger men, were crammed together in the centre of the village, surrounded by huge warriors wielding swords and axes. The Vikings were fearsome indeed, monstrous in stature and even more terrifying in deed. They were ferocious, pitiless, bearing their murderous panoply with savage effect. Any daring soul who attempted to break free was immediately threatened with those formidable weapons, to choose whether to return to the growing throng in the middle or die there in the mud, surrounded by what was left of their homes. Most did not choose to die, and as Fiona watched from the cover of the forest it became clear to her that the Vikings were not bent on murder. At least, not as the first resort. They intended to take prisoners. The realisation hit her with the force of a battering ram. These Norsemen would take their menfolk, probably as slaves. She could not allow that. She had to do something. Fiona crouched and reached blindly to scrabble in the earth at her feet for a stone. She located one, smooth and round and just the right weight. She groped for a second, which she tucked into her pocket. A third, and she was on her feet once more, taking aim. She swung the sling around her head and let fly. Her shot was true. The Viking closest to her crumpled to his knees as her missile found its target, his right temple. Fiona picked her next victim and let loose her second stone. That man fared no better than his comrade and in seconds the two were prone in the dirt, blood trickling from the wounds on their heads. 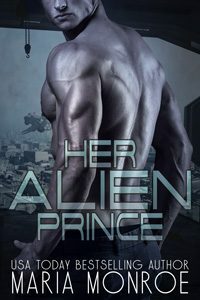 A third soon dropped to his knees when she hit his unguarded shoulder, his angry yowl of pain ringing in her ears. Fiona knew a moment’s remorse as she bent to find her next missiles, but she quelled it. She had never aimed at a person before, only animals and then only for food. But the situation was desperate and she would do what she needed to do to save her family, her village, her people. She rose and sighted her next victim. The voice was soft, deep, and stern, and emanated from a point no less than an inch from her left ear. Fiona started, tried to turn, but the press of cold metal against her neck halted that. A sword lay across her throat. One move, and she was dead. Her fist tightened around the plaited rope that formed the handle of her sling. The blade pressed against her throat, the additional pressure almost imperceptible but enough to let her know her options were limited. Indeed, she had no options. The weapon dropped to the ground. Fiona obeyed, baffled. 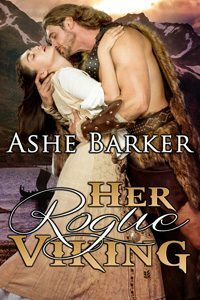 Why would this Viking wish to bind her if he meant to slit her throat? He had no need; she was defenceless now. He wrapped straps of soft leather around her wrists, tight but not painfully so. “You are an excellent shot, little wench. Which is a pity, for it shall cost you dear.” His words were matter-of-fact. He did not seem angered by her actions, nor even especially surprised. His tone was rather one of resignation, and all the more chilling for that. 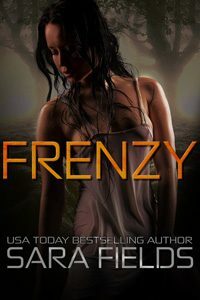 Fiona clenched her jaw as he placed his hands on her shoulders and swung her around to face him. 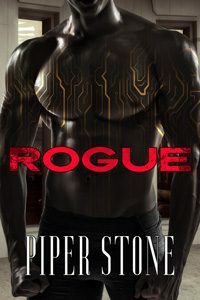 She had a momentary impression of height and breadth, a huge, solid chest covered in leather and wide shoulders draped in fine fur. She did not allow her gaze to linger however. Instead Fiona screwed up her eyes and grimaced, waiting for the slap that she was sure would come, the blow that would fell her. No blow landed. Instead, her captor bent to seize her around the knees and hoisted her unceremoniously up and over his shoulder. She let out a startled squeak and started to kick, panic bubbling at the unexpected and unfamiliar position. A hard, heavy hand applied to her upturned backside soon put a stop to that. The warning was enough to quell further struggles. Fiona hung there, the fur of his cloak rubbing against her exposed neck as he strode forward into the village. She remained still and quiet, and prayed to the merciful God she only half believed in that this huge savage would not do her or her loved ones lasting harm. Somehow, she doubted her prayers would be heeded. The Viking bent at the waist to deposit her back on her feet. 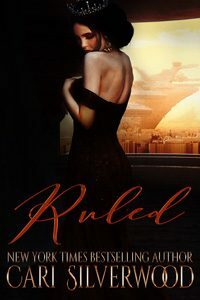 Fiona swayed, and the warlord grabbed her elbow to steady her. She allowed herself a quick glance up, and gasped. He was ferocious, almost feral in his warlike intensity. The Viking’s visage was stern, hard, the face of a battle-weary warrior. His head was bare, and she caught sight of long, flaxen-coloured locks that brushed his shoulders. It was his eyes though that captured and held her attention. They glittered in a brilliant shade of azure, like shards of ice. They were the eyes of a man who had seen too much and cared very little. Those deep blue orbs were hardened, cold, uncompromising. This man would snap an opponent in a heartbeat, and Fiona could not fathom why she still drew breath. He turned on his heel and strode off, leaving Fiona among the huddle of captives clearly destined for a life of slavery in the frozen lands to the north. The question came from Taranc who had materialised at her side moments after the massive Norseman left. Fiona presented her back and bound wrists to him, but no sooner did Taranc set to work on her bonds than a shout rang out, cutting across the babble and cries of the now dwindling strife. The Viking warlord pierced her with his merciless gaze from across the ruins of their beleaguered settlement. He now held a huge sword, drawn and ready, and Fiona entertained not a moment’s doubt that he meant what he said. Taranc stiffened behind her. Fiona sensed his indecision and knew he would defend her to the death if she but asked him. She would do no such thing. Taranc wrapped his arms around her and Fiona turned to bury her face in the soft leather of his jerkin. He bent to kiss the top of her bowed head. “My father? Adair…?” She almost did not dare to ask. “I am sorry…” His tone betrayed his anguish. “I am not sure. He may yet live. I have not seen him.” Taranc craned his neck to look over the heads of those clustered closest to them. His height gave him an advantage, but his flattened lips and narrowed eyes told their own story. Fiona’s father was not among the prisoners. Fiona nodded against his chest, though privately she doubted that would come to pass. They would not survive this. Even if they did, even if by some miraculous twist of fickle fate they should both emerge with their lives, neither would be any more enthusiastic about marriage in that stolen future than they were now. Desperation breeds rash promises, she mused. She would not dwell on it. The Norseman she had felled first rose unsteadily to his feet. He shook his head, the tangled mane of russet hair wild and shaggy about his still-bleeding scalp. He muttered something in his guttural Nordic tongue and cast his angry gaze about him. Fiona shuddered and shrank back against Taranc. Her protector shoved her behind him, but not quickly enough. The injured Viking’s eye fell upon her. Snarling, he crouched to retrieve his mighty war-axe and he lumbered forward. “Létta!” The ringing tone of the Viking who had captured her rang out once again, stopping the man in his tracks. Fiona risked a peep from behind Taranc’s broad back to see her captor, who she now assumed to be the leader of these savage marauders, striding across the ruins of her village, his sword still in his hand. He planted himself before the man who would seek his vengeance upon her and the pair exchanged rapid, angry words. The confrontation was quick but decisive, her would-be assailant backing off, his features sullen but resigned. He cast one, final murderous look in her direction before slinking back to join his comrades. The victorious warlord turned to rake her with his eyes. Fiona swallowed hard and chose not to reply. The Viking came to stand before Taranc, his head cocked to one side as he regarded the pair of them. “This is your husband?” The question was curt, simple enough, yet Fiona could not cobble together a coherent response. Had Taranc possessed a weapon and not been hopelessly outnumbered by ferocious fighting men all armed to the teeth he might have put up a decent fight, though even in her most generous moments Fiona would not have given much for his chances against this battle-hardened warrior. Still, his unswerving protection warmed her spirit and lent her the courage to face her fate. Fiona could not break his gaze, and neither could she find words to respond. Her head reeled with the import of his words. His property? He might sell her at his whim? “Wench, I would have your answer.” The Viking’s tone was harsh before. Now, it was cold as the bitter wind that blew from his northern home. “She understands. There is no need to frighten her further.” Once again Taranc stepped in to intercede for her. Fiona shook with apprehension as the two men glared at each other, the one all-powerful, the other buoyed up by honour alone. The Viking glanced over his shoulder and for the first time Fiona noted the man who stood behind him. This Norseman was tall, taller even than the one who was in command. Also bare-headed, his hair was black as the wing of a raven and a livid red scar marred his otherwise perfect features. The mark ran from beside his left eye and down his cheek to disappear under his powerful jaw. The man was clad in black, a leather tunic and leggings and a thick woollen cloak. His expression betrayed his amusement as he leaned forward on the hilt of his sword while the point pierced the muddy soil at his feet. The Viking spoke to his comrade in their own tongue. The dark one nodded and straightened as his lord turned back to face his captives. Fiona watched him stroll away, his gait deceptively casual as he issued further instructions to his men as he passed. All scuttled to do his bidding, his authority absolute. She saw no cause to doubt his assertion. The dark Viking, Gunnar, spoke no Gaelic but still his commands were readily understood by the captives who now fell to his responsibility. He ordered that the men be herded off first, allowing Fiona almost no opportunity to receive Taranc’s quick hug and hurried admonition to do as she was told and not attract attention from their captors. “I shall see you soon, I know it,” she whispered, though in truth she held no such conviction. They might not even be taken to the same destination. Fiona shivered as the men were hurried away, encouraged to make haste across the wasteland of their former homes by the jab of several swords and the occasional application of a switch if one among them seemed unduly tardy. The women left behind were few in number, just a half dozen or so. Fiona was acquainted with all of them, though not all came from Pennglas. She exchanged an anxious look with Mairead, the young widow from Aikrig, heavily pregnant, and Fiona wondered why she had been chosen since surely she could not work in her condition. Perhaps these savages just did not care. She acknowledged Quinn, another widow of middle age, also from Aikrig, who Fiona knew to be skilled in weaving. Briana, Quinn’s daughter clung to her mother and wept as their small group was prodded at sword point in the direction of the beach. Fiona recalled that Briana had been recently wed to Cedric, one of the men taken away with Taranc. Had she, too, been made to speak her goodbyes? Only Fiona was bound, and she almost stumbled to her knees as she tried to keep up the forced pace across the rough terrain. Mairead took her elbow to help steady her and Quinn stationed herself at her other side. Fiona was glad of their aid and thanked them quietly. “Begja,” snarled the Norseman closest to them. Fiona could not understand his coarse Nordic speech, but even so she and the others took his meaning well enough. The women fell silent. The next three days and nights were the stuff of nightmares. The women were forced onto a small cargo boat, where they huddled together on the floor as their Viking captors plied the oars. Neither the Viking overlord nor his dark comrade sailed with them, relinquishing the captives into the charge of a small crew of rough Norsemen. Fiona was surprised to realise she was more afraid as a result of their absence than she was by their presence. It was not yet fully the end of summer but the crossing was rough. A huge sail whipped and flapped above them, dragging the small craft across the choppy seas. Despite living her entire nineteen summers beside the sea, Fiona had never been fond of sailing. She felt nauseous from the moment she was slung on board and could hardly manage to keep down any of the hard, bland lumps of bread given to them by the barbarians who held them prisoner. Quinn coaxed her to eat, holding the bread for her since Fiona could not feed herself with her hands tied in the small of her back. At Quinn’s insistent pleading one of the Viking sailors freed Fiona’s wrists, though this small mercy did little to alleviate the discomfort of the voyage. The days on board the small boat were miserable, the nights even more so. None of the women had managed to grab warm clothing when the Vikings attacked so they shivered together until their captors relented and provided a few paltry furs for them to share. It was not much, but sufficient, barely, to stop them from freezing to death as the night-time temperatures plummeted. The bottom of the boat where the prisoners sat was damp and soon the wetness permeated their meagre clothing, adding to their ordeal. Fiona was convinced their misery could not become worse when the shout went up from one of the men at the oars. Land had been sighted. But what land? Where had they been taken? Fiona had but the vaguest knowledge of the frozen wasteland that she understood lay to the north and from whence came these fierce marauders. She had no idea what to expect of their destination, but feared the worst. The cargo ship hugged the rocky shoreline for several miles so Fiona and the other women had ample opportunity to study their new home. Green forests of towering pines covered much of the landscape, backed by mountains of deep grey capped in pristine white. Autumn had yet to arrive but already the air was chilled and snow fell on the higher peaks. Fiona saw many narrow inlets, perhaps a hundred paces in width though some seemed narrower, but all sliced deep into the land. Their sides were steep, the cliffs towering. The sea trapped between them churned and crashed against the rocks. Occasional sandy beaches hugged the coastline, and here and there Fiona discerned signs of habitation—a wisp of smoke curling above the trees, a rough mud or wooden hut, a small boat bobbing close to the shore. Eventually, the man at the helm of their own craft turned toward the coast. As they drew closer Fiona could make out the cluster of buildings, larger than the huts she had seen thus far, and a roughly constructed harbour nestling within a narrow bay. As their boat entered the harbour she could see the people on the shore, men and women scurrying about their business in this bustling little port. It was busier than any place she had seen before, and all the inhabitants seemed as fearsome as those she had already encountered. She had longed for this miserable voyage to end; now she prayed to remain at sea. Their boat collided with the harbour wall and the women were hurled to the damp planking beneath their feet. Ropes were flung over the side and the craft was secured by others waiting on shore. All too soon the women were ordered to climb up the side of the boat into the rough embrace of men waiting to haul them ashore. Fiona tried but could not climb as her fingers were numb so one of the sailors flung her over his shoulder and scrambled up until another man could grab her and drag her unceremoniously onto the rough jetty. Once ashore Fiona lay on the unsteady planking gasping for breath and wondering if she would ever feel warm again.